August 25, 2010: Interactive Conference Schedule Now Live! 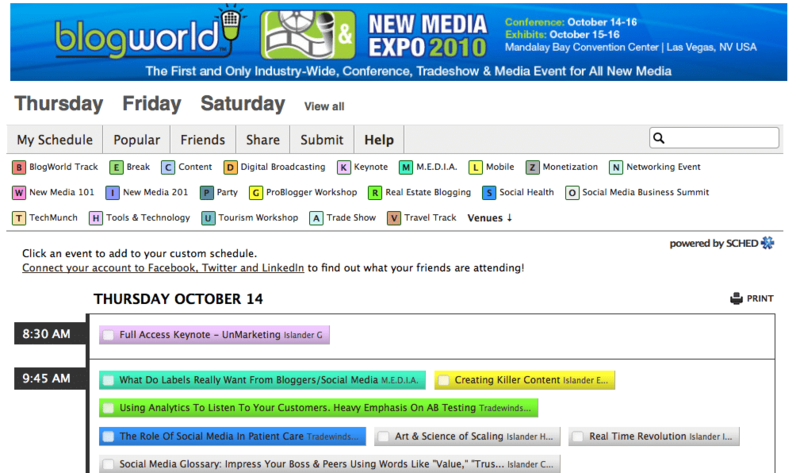 The 2010 BlogWorld Interactive Conference Schedule is Now Live! Thanks to Deb’s hard work, we have a preliminary schedule available! Once you’ve browsed the schedule you can choose which sessions you plan to attend and share them on your favorite social networks. Additional session confirmations will be announced soon – stay tuned! Last week, Valerie Rubinsky of the Philadelphia City Paper broke a news story that’s been getting national attention. Bloggers in this city are now required to purchase a $300 business license if their blog is designed to make money. For many bloggers, that price far exceeds the amount of money they make on their blog. But no matter the case, if you’re angry, you may be mad for the wrong reasons! Redesign disasters are very real, and yes, you should be scared. These disasters typically happens due to one of two reasons: 1. The redesign wasn’t actually needed. 2. The redesign wasn’t well planned. Learn how to prevent your own redesign problems! For most tech bloggers, influence is about becoming a thought leader on a specific topic in order to reach a business or personal goal. So whether you’re the world’s foremost Android expert or a complete gadget nut, the reason to strive for influence is to establish credibility – and you can’t do that alone. Someone already influential needs to vouch for you. More and more companies are jumping on board with check-in campaigns and it seems a great way to enhance business. More companies are using blogs as marketing tools, according to a new report from eMarketer. The firm estimates that one in three companies will have a public-facing blog for marketing this year, rising to 43 percent by 2012. The podcasting audience is not only bigger than they were in 2006, they are different. In 2006, the podcasting world was full of bright thinkers with big ideas to capture the nascent podcasting audience. Facebook Success Summit 2010 is a special online conference designed to help you master Facebook marketing (brought to you by Social Media Examiner). Join Brian Solis (author, Engage! ), Mari Smith (author, Facebook Marketing), Jesse Stay (author, FBML Essentials), Paul Dunay (author, Facebook Marketing for Dummies), experts from Intel, Microsoft Xbox, Cisco, SAP and the Washington Redkins; Darren Rowse (author, Problogger), Jay Baer (Co-author, The Now Revolution), and Michael Stelzner (Social Media Examiner)–just to mention a few. Click here to save 50%.